Oil prices, which averaged a near-record $103 per barrel in 2011, have risen steadily since the beginning of 2012. In tandem with oil prices, gasoline prices are also rising—from an average of $3.30 ending the week of January 2 to $3.59 last week. Higher gas prices mean that money is flowing out of Americans’ wallets and pocketbooks and straight into the coffers of Big Oil companies. This Center for American Progress analysis finds that each penny rise in the average quarterly (three months) price of a gallon of gas corresponds to a $200 million increase in quarterly profits of the big five oil companies—BP, Chevron, ConocoPhillips, ExxonMobil, and Royal Dutch Shell. Since the beginning of the year, the price for gasoline increased 29 cents per gallon. If that average increase holds true through the end of March, it will translate to $5.8 billion in additional profits for the big five. CAP analyzed the past four years of average quarterly gas prices and total profits for the five largest oil companies and, not surprisingly, oil company profits are closely linked to gas prices. 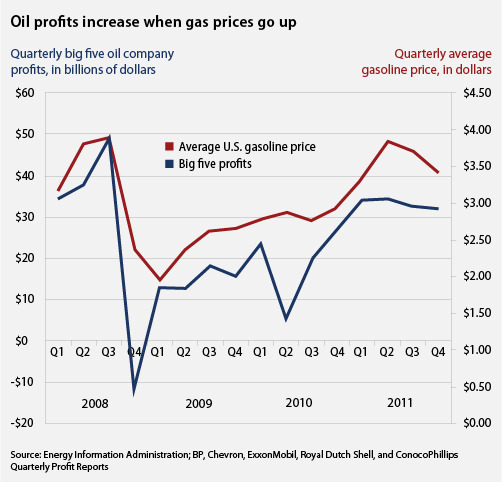 While gas prices aren’t the only factors influencing profits, they are a significant indicator. What’s more, we can confidently predict how much money each penny increase in gas prices transfers from consumers to the big five oil companies. Just this past January the typical household paid about $290.76 for gasoline, up by $25 over the same one-month time span in January 2011. It looks like households will face a similar increase in gasoline expenditures in February with gas prices on the rise even though demand is the lowest it’s been since 1997. This especially affects the 82 million households that spend 6 percent or more of their annual household budgets on gasoline. High oil and gasoline prices in 2011 enabled the big five companies to rake in $137 billion in profits last year. These enormous earnings contributed to the $1 trillion in profits they earned from 2001 through 2011. Despite a profit figure with 12 zeroes—count them: $1,000,000,000,000—these oil giants are major players in the lobbying efforts to retain $4 billion in annual tax breaks for oil and gas companies that they clearly do not need. In the scheme of all things Big Oil, these tax breaks are small, particularly in relation to their profits and in light of the fact that in 2011 these companies also had a combined $58 billion in cash reserves, nearly 30 times more than they received in special tax breaks. Still the big five oppose ending their taxpayer handouts. Many of those same oil industry leaders oppose actions that would save consumers money at the pump. Former Shell Oil CEO and founder of Citizens for Affordable Energy, John Hofmeister, for example, opposes selling a small amount of reserve oil from the nearly full U.S. Strategic Petroleum Reserve to lower gas prices, which would provide some relief to drivers. And why wouldn’t he be against such a move? Lower gas prices mean lower profits for Shell. The company’s current CEO, Peter Voser, made $13 million in executive compensation in 2010. The other four CEOs made a combined $40 million in 2010, and will likely have made more in 2011. Instead of using their outrageous profits to invest in alternative energy sources or create jobs, the big five and other oil and gas firms spent more than $146 million lobbying Congress last year. 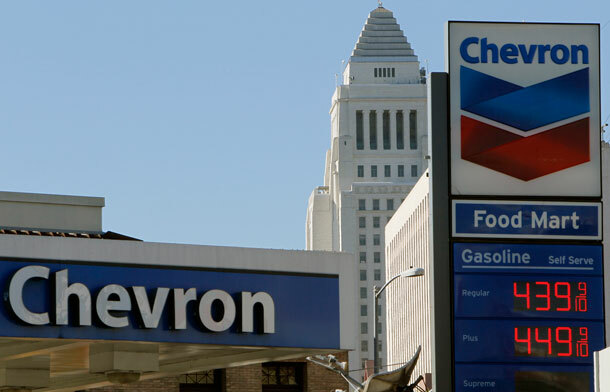 The big five oil companies alone spent more than $18 million on federal campaign contributions. Ninety percent of these contributions went to Republican candidates and 10 percent to Democrats. Many of these politicians were the loudest defenders of oil tax breaks. It makes absolutely no sense to remain susceptible to a volatile global oil market. Instead we need to reduce our dependence on oil, which is priced globally and partly set by the OPEC cartel. President Barack Obama has made a significant start by proposing to double vehicle fuel efficiency standards by the year 2025. By that year, modernizing vehicle fuel efficiency will save the average car owner $8,000 in lower gas purchases over the life of a vehicle compared to a car bought in 2010. While these improved fuel economy standards are taking effect, selling a small amount of reserve oil this year could reduce gasoline prices by 5 percent to 19 percent, which means a reduction of 18 to 72 cents per gallon. This would provide some much-needed relief for middle- and low-income families whose budgets are already strained. And so what if it shaves up to $14 billion in profits from the big five oil companies? We know they can easily afford it. Methodology: We ran a regression analysis with the nominal values for average quarterly gas prices (the independent variable) and quarterly oil company profits (the dependent variable) from 2008 through 2011. This showed a coefficient of 20.3, meaning that when average gas prices change by $1 over a quarter, big five profits change by $20 billion. The p-value for this analysis is 0.000117, which indicates a statistically significant positive relationship between the two values. We are willing to share this data and analysis with any interested parties. Richard W. Caperton is Director of Clean Energy Investment, Jackie Weidman is a Special Assistant, and Daniel J. Weiss is a Senior Fellow and the Director of Climate Strategy at American Progress. This figure is based on 2008 data because of gas prices similar to 2011 (2011 data not yet available).